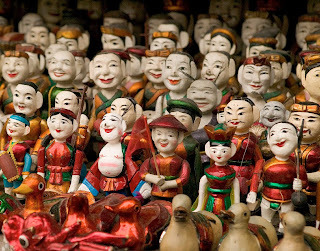 If you are ever in Hanoi it will be regretful to miss the Water Puppet Theater – even if you think you are not a puppet kind of person. Water Puppets literally means puppets that dance on the water. This show is not just geared for kids, but meant to delight adults as well. In ancient Vietnam, the rural Vietnamese believed that spirits controlled all aspects of their life, from the kitchen to the rice paddies. That is the reason why the farmers in this region devised a form of entertainment and worship to satisfy these spirits. Water puppetry is the lively creation of farmers who spent their days in flooded rice fields. At some point, they discovered that the water was an excellent medium for puppetry: it not only concealed the puppeteers’ rod and string mechanisms, but it also provided exciting effects like waves and splashes. 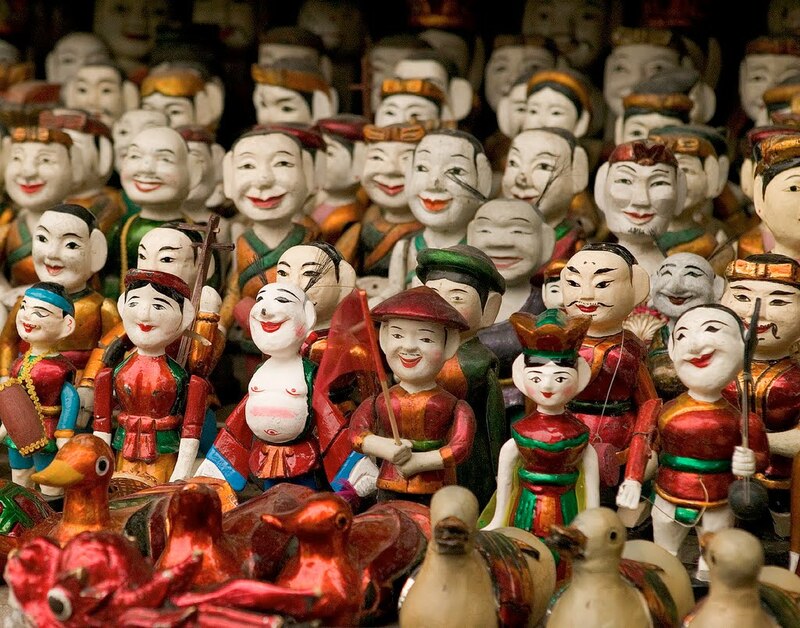 For over a thousand years, performers in Vietnamese Water Puppet Theater feet have always suffered in cold and wet condition. Water puppetry is performed in a chest-deep pool of water, with the water’s surface as a stage. The puppeteers stand behind a screen and control the puppets using long bamboo rods and string mechanism hidden beneath the water surface. The water also provides the best setting for the puppeteers’ theme: day-to-day village life. Water puppets bring wry humor to scenes of farming, fishing, festival events such as buffalo fights, and children’s games of marbles and coin-toss. Fishing turns into a game of wits between the fisherman and his prey, with the fisherman getting the short end (often capturing his surprised neighbor by mistake). Besides village life, scenes include legends and national history. Lion dogs romp like puppies while dragons exhale smoke and shoot sprays of water at the audience. Teu, a pig-tailed bumpkin, is the character who usually plays the role of introducing the performances. The introduction is always accompanied by a small folk orchestra. Spotlights and colorful flags adorn the stage and create a festive atmosphere.